Old Fashioned Pumpkin Pie is everything it’s cracked up to be. It’s an old-fashioned and absolutely delicious way to make Pumpkin Pie with all the spices that make it so delicious. 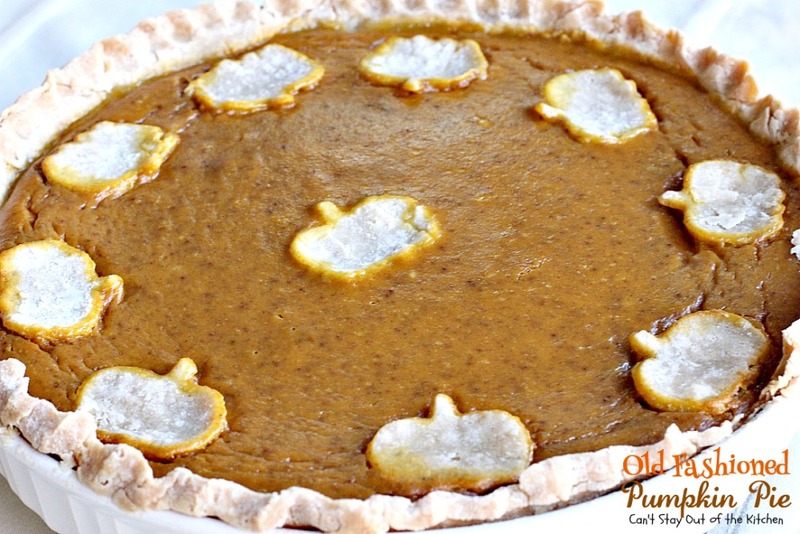 This makes a fabulous dessert pie for Thanksgiving or Christmas, obviously, but if you enjoy pumpkin there’s no reason why you can’t make Old Fashioned Pumpkin Pie any time of the year now that canned pumpkin is available all year round. 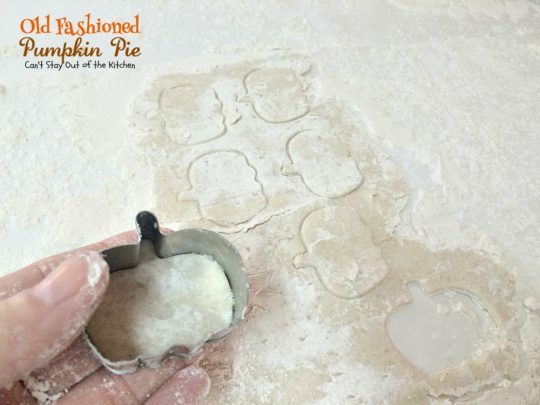 I always make this in a Homemade Pie Crust, but if you’re not proficient in making pie crusts, then you can always use a store bought pie shell. Believe it or not, this is not even my Mom’s Pumpkin Pie recipe. It’s my sister’s! I used to make Mom’s Pumpkin Pie recipe all the time for Thanksgiving dinners, but last year my sister asked me to help in the kitchen and she wanted me to whip up this pie. Phillis only used the basic amount of spices, but I added a little bit of each one to amp up the spices a little more. 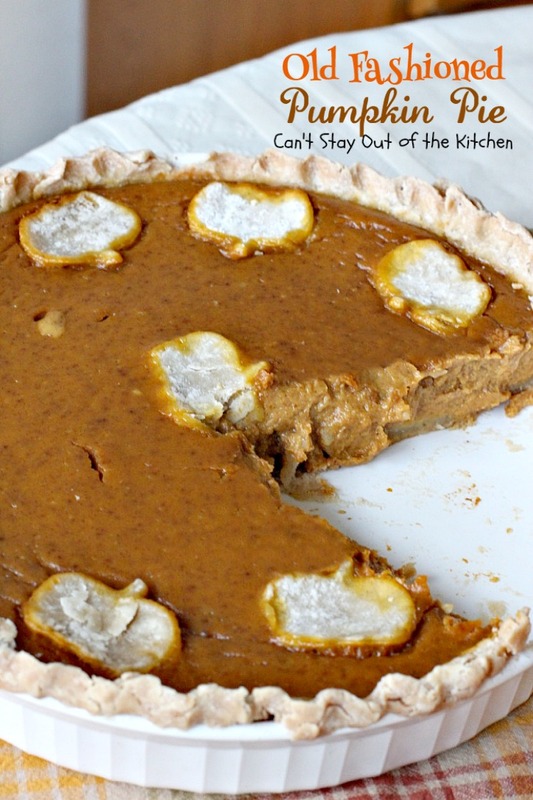 I cut out fall leaves from the pie dough for that pie last year. I looked everywhere and couldn’t find any cookie cutters like that. The best I could do was a cookie cutter with pumpkins so that’s what I used. Even so, I had SO MANY pieces of that pie last year! I knew that I would have to make it the next time I decided to make Pumpkin Pie. Well, that opportunity came the second week of December when our son flew in from Pennsylvania for a few days. 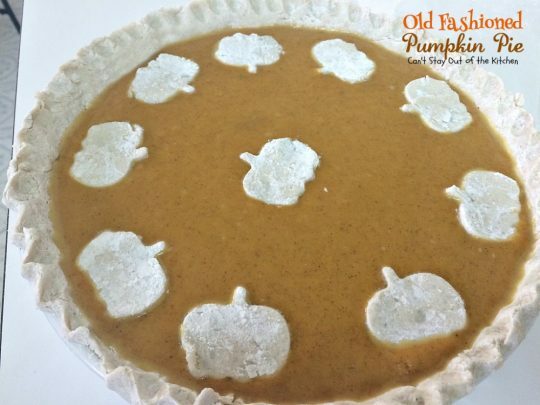 I made up his favorite Custard Pie, a Coconut Custard Pie and this Old Fashioned Pumpkin Pie. (Yes, I STILL spoil my kids). Our son spent half his time with us and half with his brother, so we had plenty of opportunities to eat pie over those few days. And eat pie we did! 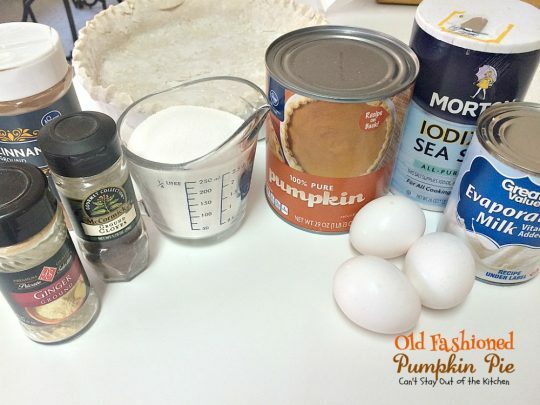 Old Fashioned Pumpkin Pie is one of the BEST pumpkin pies you’ll ever eat! 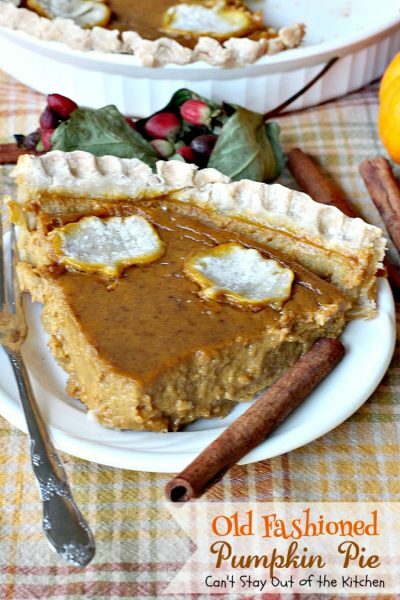 Old Fashioned Pumpkin Pie is filled with cinnamon, ginger and cloves which spice the pie just perfectly. 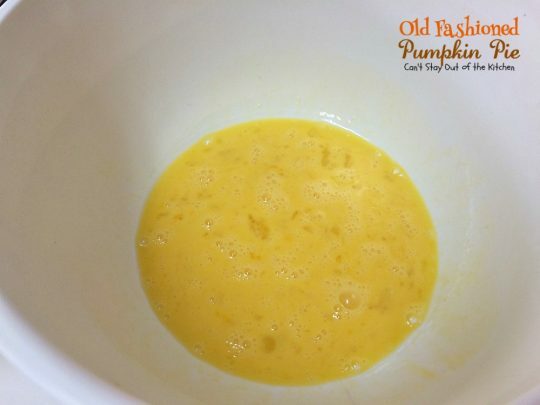 Beat eggs in a mixing bowl. 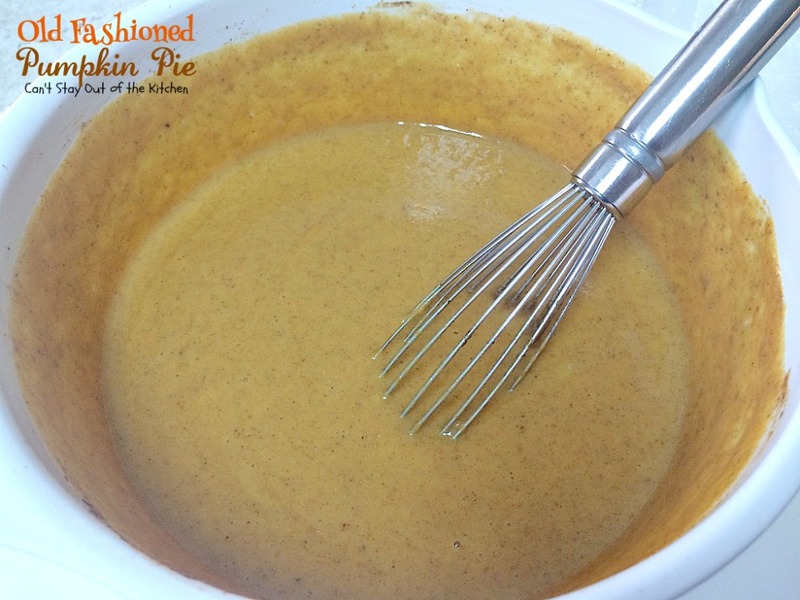 Pour pumpkin filling into an unbaked pie shell. With extra pie dough I cut miniature pumpkins for the top of the pie. This step is completely optional. Place cut-outs on top of pie in any pattern you desire. Bake at 325 about 1 hour and 15 minutes or until a knife inserted in center comes out clean. If your crust starts getting too brown during baking time, then tent with foil. Cool completely. 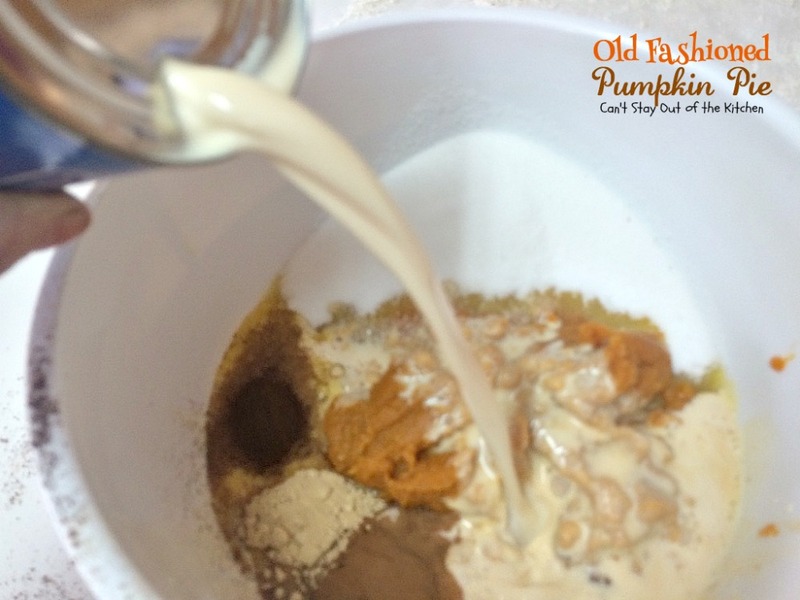 Serve Old Fashioned Pumpkin Pie with Cool Whip or ice cream. 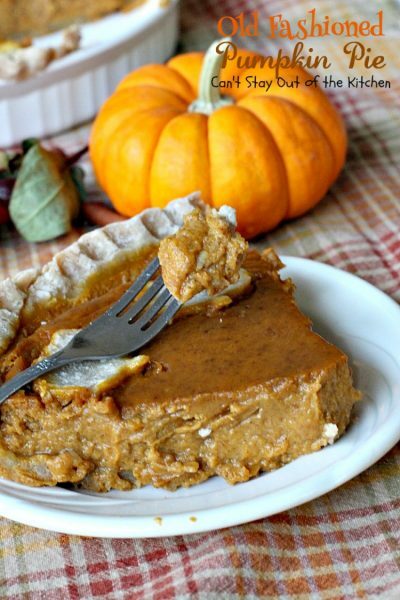 If you’re looking for the BEST Pumpkin Pie recipe, give this great pie a try. 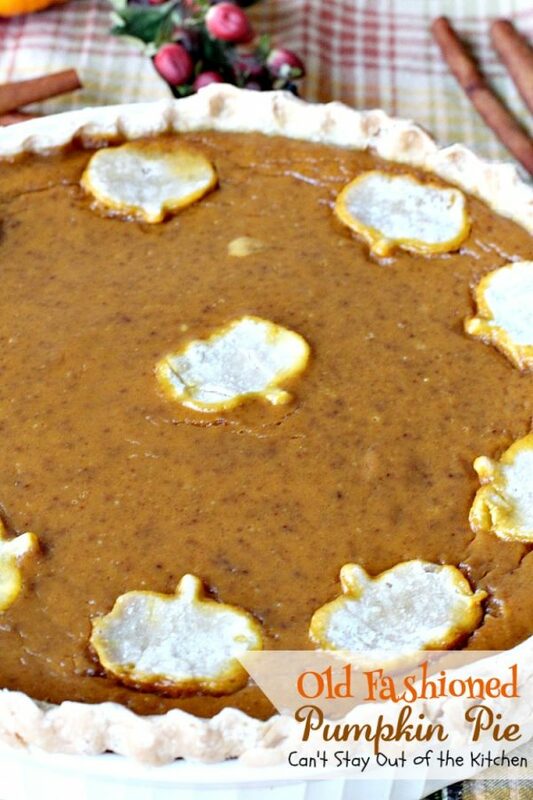 This amazing pie is one of the best pumpkin pies you'll ever eat! The filling is quick and easy to make and an excellent choice for Thanksgiving or Christmas desserts or parties. Carefully place pie into the middle rack of oven. Bake about 1 hour to 1 hour 15 minutes or until a knife inserted in center comes out clean. If desired, serve with whipped cream or ice cream. NOTE: If pie crust starts browning too much, carefully tent the pie with foil being careful not to allow the foil to stick to the pumpkin filling. NOTE: This recipe also works well with mashed, cooked butternut squash or sweet potatoes. NOTE: Preparation time does not include time required to prepare a Homemade Pie Crust. 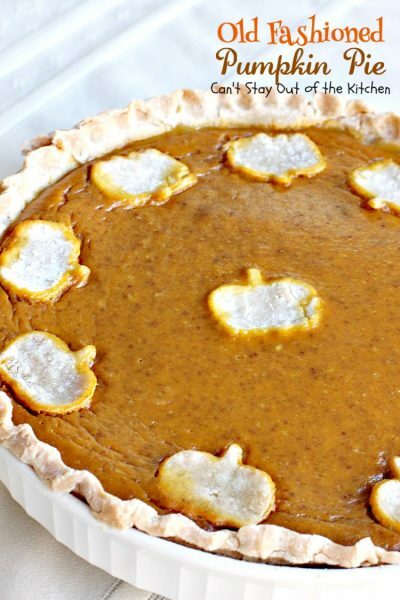 This amazing pie is one of the best pumpkin pies you’ll ever eat! The filling is quick and easy to make and an excellent choice for Thanksgiving or Christmas desserts or parties. 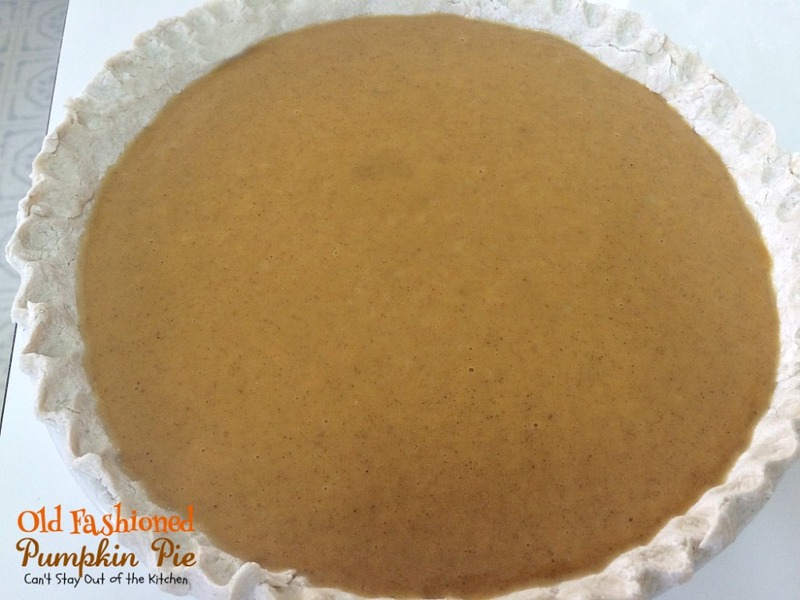 Pour into [url href=”http://cantstayoutofthekitchen.com/2012/12/05/homemade-pie-crust/” target=”_blank”]unbaked pie shell[/url]. If pie crust starts browning too much, carefully tent the pie with foil being careful not to allow the foil to stick to the pumpkin filling. 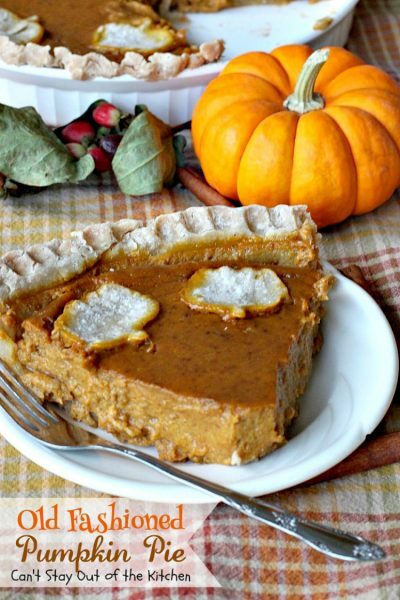 [br][br]This recipe also works well with mashed, cooked butternut squash or sweet potatoes. [br][br]Preparation time does not include time required to prepare a [url href=”http://cantstayoutofthekitchen.com/2012/12/05/homemade-pie-crust/” target=”_blank”]Homemade Pie Crust[/url]. This pie makes a great holiday treat. 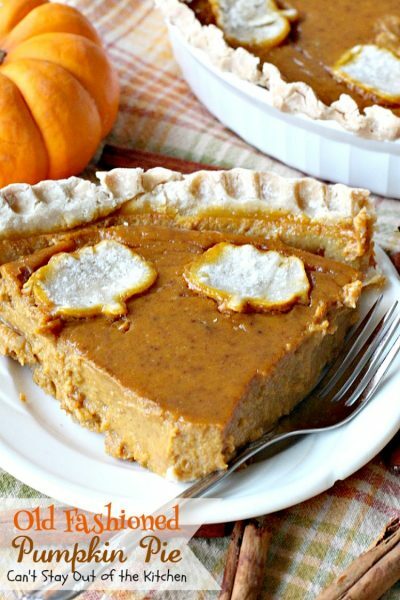 It’s time for a slice of Old Fashioned Pumpkin Pie. You may also enjoy these delightful recipes!